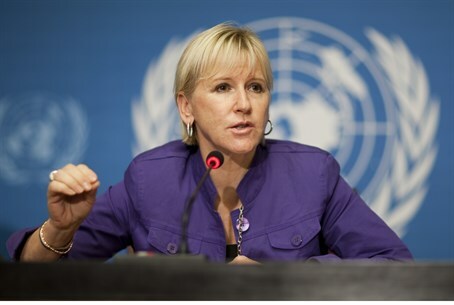 Sweden's foreign minister says Israel overreacted to her country’s recognition of “Palestine”, and that it is irritating its close allies. Sweden's foreign minister, Margot Wallstrom, said on Friday that Israel had overreacted to her country’s recognition of “Palestine”, and that it had irritated close allies with its reaction. "It is unacceptable how they have been talking about us and everybody else," Margot Wallstrom said in an interview with the daily Dagens Nyheter and quoted by Reuters. "It has irritated not only us, but the Americans and everyone who has anything to do with them right now." The announcement of Sweden's recognition of "Palestine" in late October saw withering verbal jabs about IKEA furniture between Foreign Minister Avigdor Liberman and Wallstrom, as well as Swedish financial institutions boycotting Israeli companies. Most recently, Wallstrom announced she was indefinitely postponing a planned trip to Israel, and on Thursday, Israel said that Wallstrom was not welcome for an official visit in the country. In Friday’s interview, Wallstrom said Sweden supported Israel, the Palestinian Authority (PA) and peace, but was sharply critical of Israel's policies. "Israel has been extremely aggressive," she charged, adding, "They have continued with their settlement policies, they have continued demolitions, they have continued with their occupation policies which entail a humiliation of Palestinians, which makes the (peace) process difficult." Sweden’s recognition of “Palestine” came as a series of similar votes were made in other European countries as well. British lawmakers voted overwhelmingly on October 13 in favor of a non-binding motion to "recognize the state of Palestine". Spanish lawmakers also adopted a motion calling on the government to recognize a Palestinian state. A similar vote is planned in Belgium, where legislators are working on a resolution to recognize a Palestinian state.